The first Dream Chaser orbital mission will be a cargo flight to the International Space Station, now scheduled for late 2020. WASHINGTON — NASA has given Sierra Nevada Corporation (SNC) formal approval for the company's first cargo mission to the International Space Station in late 2020. 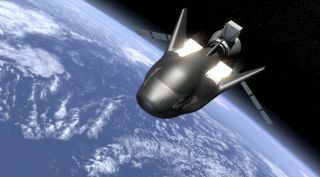 SNC announced Feb. 7 that it had received "authority to proceed" on that mission using the company's Dream Chaser vehicle. The mission will launch on a United Launch Alliance Atlas 5 rocket in late 2020. The mission is the first of six in the company's Commercial Resupply Services (CRS) 2 contract it won in 2016 to transport cargo to and from the ISS. SNC received a CRS-2 contract along with current CRS providers Orbital ATK and SpaceX. "While we won the contract a couple of years ago, the contract still needed to be validated by a task order," said Mark Sirangelo, executive vice president of SNC's Space Systems business area, in a Feb. 7 speech at the Federal Aviation Administration's Commercial Space Transportation Conference here. That order, he said, is the "biggest step" to date on the program. That flight will be a "full scale, fully operational mission," he said, even though it will represent the first orbital flight of the Dream Chaser. Orbital ATK and SpaceX, who developed their Cygnus and Dragon spacecraft, respectively, under earlier NASA Space Act Agreements, flew demonstration missions before starting their operational CRS cargo flights. Dream Chaser, which SNC had been developing for NASA's commercial crew program, will be able to transport up to 5,500 kilograms of cargo to the station. The lifting body vehicle can return up to 2,000 kilograms of cargo from the station, making a runway landing at the Kennedy Space Center's Shuttle Landing Facility or other airports to enable rapid access to experiments or other time-sensitive cargo after landing. SNC is currently building that first flight vehicle, with hardware under development now in advance of a critical design review planned for the middle of this year. Company officials said earlier reviews identified no "showstoppers" that would prevent hardware production even ahead of that review. "We are now moving forward quite rapidly on our CRS-2 program," Sirangelo said. A Dream Chaser engineering test article completed a glide flight in November at NASA's Armstrong Flight Research Center in California. NASA later confirmed that the flight met all the requirements for a milestone in an earlier commercial crew Space Act Agreement with SNC.